What Is DA Form 4187? 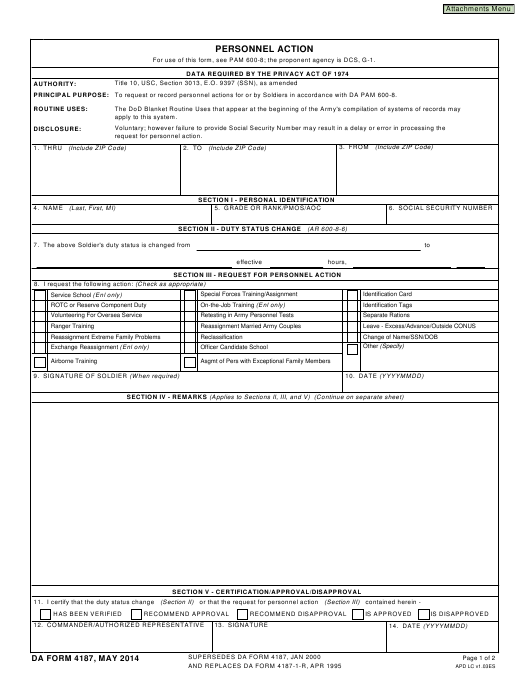 DA Form 4187 or the Personnel Action Form is a form used in the U.S. Army to request a personnel action. Using the form, soldiers can request a number of personnel actions including training, a name change, a reassignment, extra rations and more. The DA 4187 was last revised by the Department of the Army (DA) in May 2014 with all previous editions obsolete. The form - often incorrectly called the DD Form 4187 - can be supplied through the chain of command or downloaded down below. How To Fill Out A Da Form 4187? For use of this form, see PAM 600-8; the proponent agency is DCS, G-1. To request or record personnel actions for or by Soldiers in accordance with DA PAM 600-8. When filling, keep in mind that the more information you provide the faster your request will be processed and the more likely it is to be approved. The form includes five sections. Remember that the soldier can request more than one personnel action using a single DA Form 4187. Section I includes basic identification information: soldiers full name, rank and social security number. The failure to include the SSN may result in delays or errors when processing the document. Section II must be filled out in cases when the soldier is having a change of duty. You must fill in soldiers' former and new duties, the effective date and time the change takes place. Section III must be checked if a different action is required. Check all the options you would like to request. If the form does not provide the needed option, write it in the column titled "OTHER" and give a short description. After you filled all the requests, date and sign the form in Section III. Section IV is used for additional remarks regarding your request. Remarks apply for Sections II, III and IV. Again, the more information you provide and the more clear you are in your remarks, the more likely your request will be approved. It is also important to provide a solid reason for your request with as much detail as possible: this will aid the officer or department in making the decision. Section V includes certification and space for recommendations from a commanding officer or authorized representative. The representative can provide one of the following: verification, a recommendation, or approval regarding the soldier's request. Finally, the authorized representative must sign the document before it will be sent to the appropriate agency or department. The DA Form 4187 is important in cases when a soldier wants to enroll in the Married Army Couples Program (MACP). This program provides soldiers with the opportunity to form a joint domicile while performing any tasks for the U.S. Army. According to AR 614-200 Section IV, the MACP cannot guarantee reassignment together but it does ensure that both soldiers will be considered for the same future assignments. Joint domicile will be established if that is possible. To enroll in the program soldiers should submit a DA Form 4187 plus a copy of their marriage certificate to their Bde S-1/BCT or MPD who will update the Total Army Personnel Database (TAPDB). Note that the application for enrollment in MACP should be submitted no later than 30 days from the date of the marriage. However, in case of marriage to a member of another branch of U.S. Military (like Navy or Air Force), it is impossible to enroll in the MACP program for automatic joint domicile consideration. However, soldiers can request a reassignment to join their spouse by submitting a DA Form 4187 to their career branch at Human Resources Command (HRC), Fort Knox, KY. The Army intends to extend the courtesy of the MACP whenever possible in the future. It is also possible to update soldiers preference for joint or separate deployment cycles via the Assignment Satisfaction Key (ASK) web page. The preference will be used by HRC assignment managers in the reassignment process and by commanders as they deem appropriate.